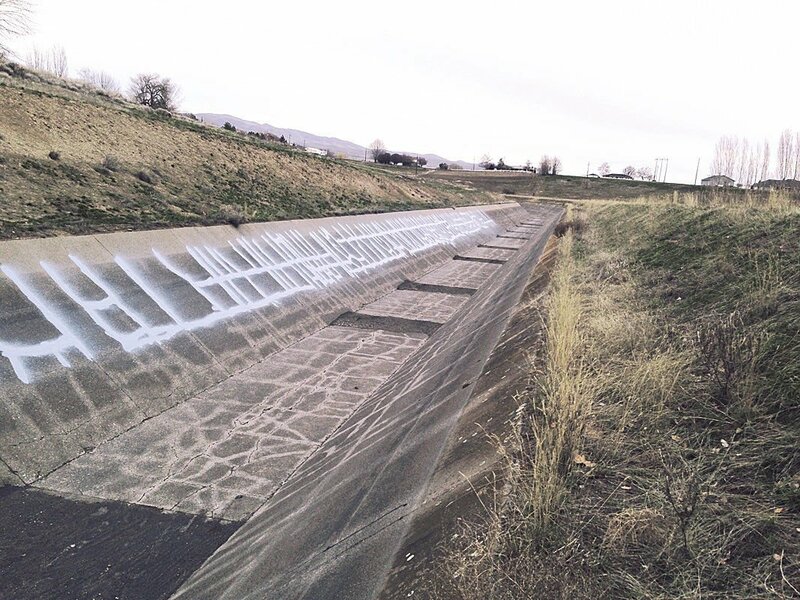 Large equipment, center of photo, sits in bottom of Roza Irrigation District canal near Moxee, Wash. Graffiti look is crack sealant work. Sealed cracks on sidewall and unsealed but sandblasted cracks on bottom of Roza Irrigation District canal near Moxee, Wash.
Black strip is a newly-installed expansion joint in Roza Irrigation District canal near Moxee, Wash.
MOXEE, Wash. — A little more than a mile of the Roza Irrigation District canal near Moxee has been cleaned and cracks sandblasted and sealed in preparation for the start of the irrigation season, March 15. Prep started a month ago and $375,000 worth of sealant work is being done by Matheson Painting Contractors of Pasco. The state provided $350,000 as part of the conservation element of the Yakima Basin Integrated Water Resource Management Plan and $25,000 came from the U.S. Bureau of Reclamation which manages irrigation diversions on the Yakima River. The RID canal flows 95 miles from Roza Dam, north of Selah, to Benton City. Of the total, 25 miles are concrete-lined, dating back to the 1940s and 1950s. A couple more miles are concrete-lined tunnels and siphons and there’s about a mile that’s lined with a plastic, rubberized fabric, said Scott Revell, RID manager in Sunnyside. The remaining 67 miles of the canal is earthen. Seepage occurs but is lessened by fast flowing water creating a hard pan of silt on the canal bottom. Cracks in six of the 25 miles lined with concrete have been repaired since 2006. The intent is to conserve water. Revell is pursuing more grants for $5 million to $6 million worth of sealant work in coming years. More than half of the 25 miles of concrete-lined canal is in the Moxee area from Terrace Heights to Konnowoc Pass. There are portions near Sunnyside, Prosser and Benton City. Beside the sealant work, the RID has been repairing parts of the concrete liner that have buckled over time from heat of the sun. Some of that damage was caused during last year’s May 11 to 31 shutdown and dewatering of the canal to conserve water during the drought. Seventeen expansion joints to lessen buckling have been installed in the canal this winter and that many or more will be installed the next two winters, Revell said. Revell is eager for winter work to be finished and said he’s “nervous” about the upcoming irrigation season. It’s too early to know, he said, if there will be any water restrictions similar to last year. That’s when the district cut water to farmers by up to 75 percent and did the May shutdown. The district and other junior water right holders in the Yakima Basin received 47 percent of their normal supply due to the drought caused by light mountain snowpack. Crop losses in millions of dollars resulted. So far this season, he state’s water supply specialist is warning that little mountain snowfall in the past month and warmer than normal temperatures is accelerating snowpack melt by a month. The U.S. Bureau of Reclamation, that manages irrigation diversions from the Yakima River, will release its first water supply forecast for the season March 7.